I will blog often about student loan debt. Student loans are just a bill you must pay. Most people have education debt in some form or another. Federal and private student loans are not typically handled by a bankruptcy filing. However, other debts like financed cars, credit cards can hinder student loans from being paid. Student loans are the next housing bubble. Most families simply cannot afford to send children to college without financial help. Other than working with the financer directly (there are some programs available) there is not a 3rd party program to consolidate loans to an affordable payment. Simply, you must pay the loans. On July 1st, the interest rates on federal student loans will increase. Stafford loans for undergrads will rise from 3.86% to 4.66% and PLUS loans will increase from 6.41% to 7.21%. If you have a large balance in student loans and other debt, the increased payment could significantly affect your budget. Bankruptcy will not help eliminate your student loans. But, you could eliminate the rest of your debt to make the loans affordable. When there is substantial other debt (i.e. credit cards, payday loans, etc), something has to give. Whatever is not paid, can go into collections and ultimately into a lawsuit. Take the long weekend and make a budget. You can use a Geraci Law version by clicking here. If you have more going out then coming in, give us a call to see if bankruptcy can help! Many people do not realize they owe medical bills. After a hospital stay or doctor’s visit, it’s easy to assume insurance covers 100% of the cost. If unpaid, a bill can go to collections and start negatively affecting a credit score. Debt is reported to credit bureaus in two ways – from the original creditor (i.e. doctor, hospital) or from a collection agency. Majority (close to 99.4% according to Consumer Financial Protection Bureau) is reported by collection agencies. Most medical bills are caused by expensive and unexpected procedures – i.e. emergency surgeries, hospital stays, and emergency room visits. Insurance may pay part but not the entire bill. You could easily find yourself owing thousands for an emergency room visit. Bankruptcy is an option. If you have a tremendous amount of medical bills, filing a bankruptcy will alleviate the stress that comes with owing. I spoke with a man from Illinois who was diagnosed as a diabetic. He was uninsured and spent three days in the hospital. In the end, the bills amounted to over $80,000. Without a bankruptcy option, he would spend the rest of his life trying to pay down a three day visit. Retirement should mean enjoying golden years and relaxation. It shouldn’t mean stress and sleepless nights trying to figure out a way to juggle debt. When most people retire, most live off a pension or Social Security benefits. Trying to pay debt, prescriptions and other expenses is difficult when you have other expenses. Last year, people receiving Social Security benefits received a cost of living increase. Around the same time, the cost of Medicare and Medicaid increased, many retirees lost income. Many need to pay for supplemental insurance adding another expense to a fixed budget. Increases in living costs can be disastrous for a fixed income. Monthly fixed expenses easy to pay when you are working are budgeted for when you retire. According to the Bureau of Labor Statistics, the cost of a gallon of milk increased 50 to 60 cents per gallon since January 2014. A gallon of milk could be a luxury for someone on a fixed income! If you are about to retire and have debt; consider bankruptcy so you can retire debt-free! By eliminating the minimum payments on your unsecured debt, you can readjust your budget to afford the rising costs of things like milk. I am the 4th generation of lawyer in my family, going back to my great-great grandfather, Francis Albert Hoffmann, who was lieutenant governor of Illinois during the Civil War, a founder of the Republican Party and staunch abolitionist, my great-grandfather Francis A. Hoffmann, who was corporation counsel of Chicago in the 1880’s, and my grandfather Francis A. Hoffmann, who went to North Division High School in 1905 (now Lincoln Park High School), Knox College and Univ. of Michigan Law School. My mother unfortunately was unable to go to law school, but my sister is an attorney, and so am I. I am quite proud of my family, and my profession. So it pains me when ignorant people make lawyer jokes, or take a line from Shakespeare like “Let’s kill all the lawyers” out of context and spout it with an ignorant laugh. Many of our clients are elderly, and we file their Chapter 13s to protect their paid off home and repay creditors with lower interest and no late payments. Occasionally, a husband or wife will pass away during the case. In this case, the wife passed at the end of the case, after they completed the payments, but before completing the requirement of certifying that she had no outstanding Domestic Support Obligations. You would think that it would “go without saying” that a 78 year old grandmother was not under any court order to pay support, but that is the law. Since the wife was deceased, Geraci Law attorney Megan Hayes obtained an affidavit from the surviving spouse, and when the Clerk marked it a “non-conforming document”, the kindly bankruptcy judge issued an order on the Clerk to make it conform, and both the surviving spouse and the deceased debtor received their discharge. I am very proud of all the 76+ Geraci Law attorneys, not to mention our fine paralegals, for this kind of service to our clients. As Shakespeare put over 400 years ago in in Measure for Measure, which was all about lawyers, “Good counselors lack no clients”! I live in downtown Chicago, and hawks eat most of the birds they can catch. 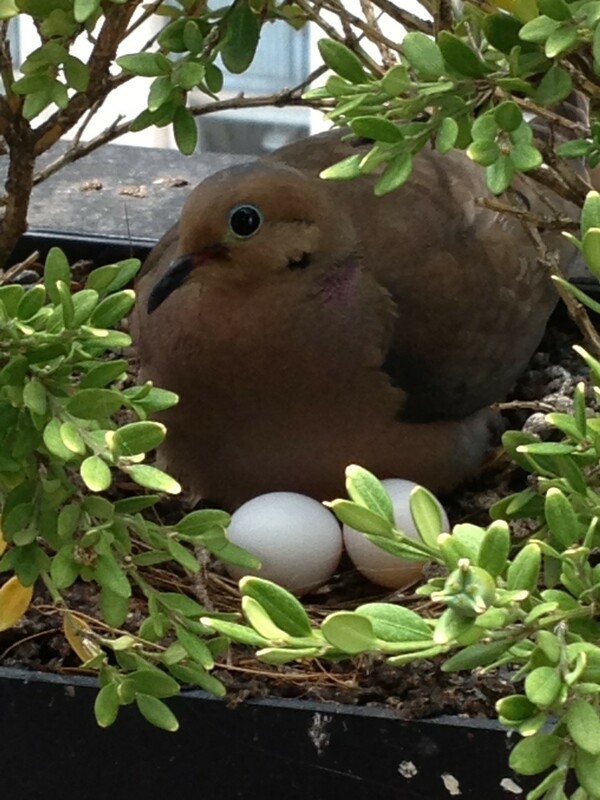 Doves nest on my balcony, under the privet bushes in my window box. Doves, like swans and magpies, mate for life, and will come back to the same safe nest year after year. Hawks can’t see them because of the bushes, and the color of the dove blends in with the soil! You need to protect your home and family from the creditor hawk, too. That means keeping your rent or mortgage current, and protecting yourself and your family from lawsuits, foreclosure, wage deductions, and recovering from illness, job loss and family problems. That’s what we do at Geraci Law! Take my free non-bankruptcy credit counseling course at www.pfged.com, to find out how to protect your nest!